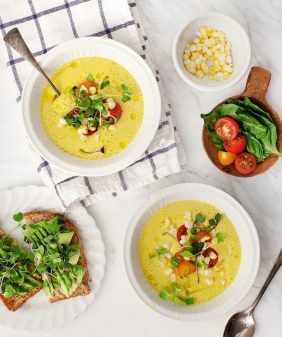 This simple gazpacho recipe uses just 10 ingredients to make a luscious, richly flavored soup. Garnish it with mango for a surprising sweet twist! You didn’t think I’d talk about all of the food from our Yellow Table dinner party without sharing a recipe did you? We don’t do many guest posts on this site, so today I’m excited to share this (literal!) guest recipe. We had so much fun hosting Anna for the weekend, we couldn’t help but snap some photos in our kitchen while she prepped for dinner. This gazpacho was SO delicious (and also super easy) – I absolutely needed the recipe. It starts with some gorgeous peak-season tomatoes that we picked up that morning at the farmers market. She added them to the blender with cucumbers, cilantro, red onion, and olive oil (among other things). I was surprised how few ingredients she used to create such a rich creamy flavor. (It actually brought me back to this one that I had a few years ago on a beach in Spain). Her special twist? Garnishes of sweet cherry tomatoes, diced cucumber and diced mango – yum! Special thanks to Anna for the recipe! 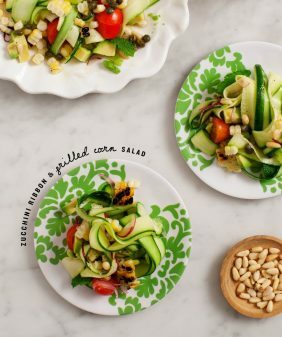 For more summer recipe ideas, try this cherry tomato salad, this pasta salad, or this roasted veggie pasta! Finely chop ¼ of a cucumber and reserve for garnish. Peel the remaining cucumber and cut into chunks; place in a large bowl. Add in the tomatoes (and juices), ¼ cup red onion, garlic, ½ cup of cilantro leaves, red wine vinegar, and olive oil, stirring to combine. Season generously with salt and pepper. Place half of the mixture in a blender or Vitamix and blend until as smooth as possible. Strain the mixture through a fine-mesh strainer, and repeat with the remaining tomato mixture. Taste and adjust seasoning as necessary (I usually find it needs more salt). Place the mixture in the refrigerator and let chill, covered, for at least 2 hours. 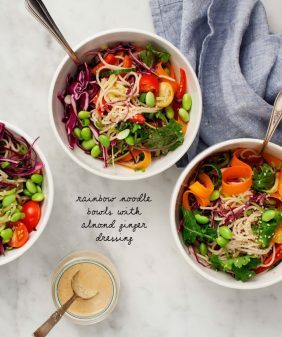 Serve in bowls, garnished with the remaining cucumber, red onion, cilantro, mango, red and yellow cherry tomatoes, and a drizzle of olive oil. How freaking fun is this?! Such a pretty soup! 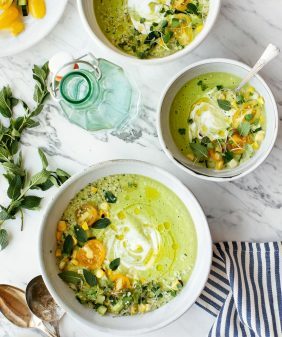 Gorgeous soup for the summertime! I think I’ll make some this week! I can’t wait to try this soon! Not quite tomato season yet here in Michigan. This looks so pretty and refreshing. This sounds so lovely! And I LOVE all that beautiful color! Oh my goodness what a gorgeous soup! I love the mango in the garnish as well. Perfect. OMG this is just gorgeous!!! That color is to die for! I will for sure be trying this one. YUM! Looks insanely delicious. By the way, I’m the reader who commented on your pickled chard stems post and said I bought rainbow chard specifically for your recipe. I made it, and it was awesome. Thanks! 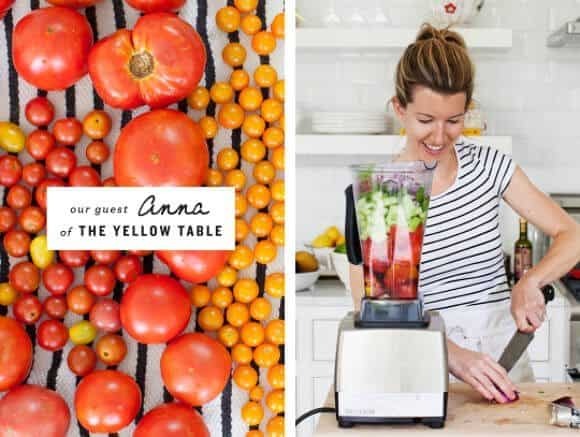 I was really hoping you’d share her gazpacho recipe but I wasn’t expecting it either, since it came from her cookbook. So what a pleasant surprise! Love the mango in it and I can’t wait to make this once I’m home! it’s SO good – I just loved the mango addition! I made this yesterday, and it’s probably the best gazpacho I’ve had. I love the topping too – the crunchy texture and the added sweetness of the mango is a perfect contrast and compliment to the soup. Hi Katie, so glad to hear! 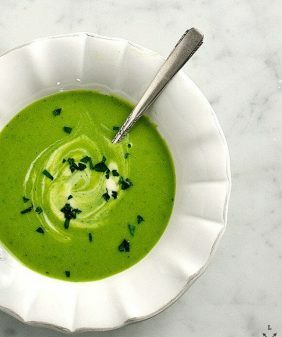 What a gorgeous soup! I love the garnishes on this one as well. 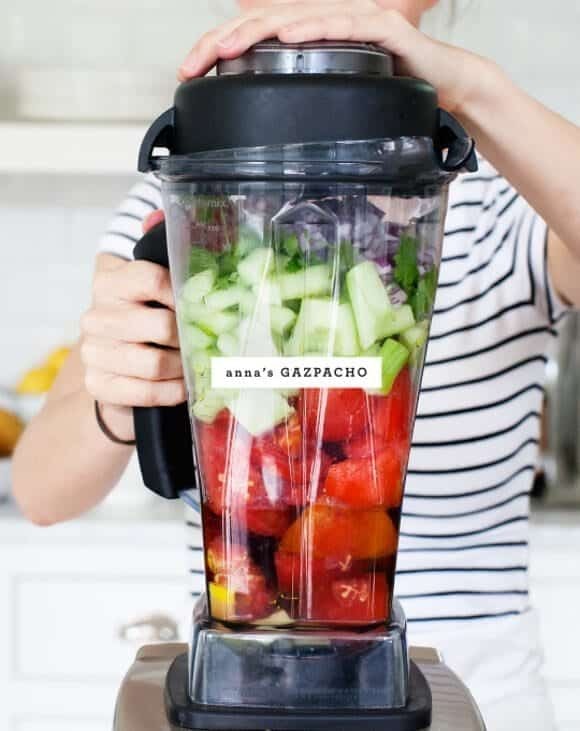 I need my gazpacho to be a little chunky, this one looks perfect! Wow..this looks yum… very inspiring place this one, gotta visit often. 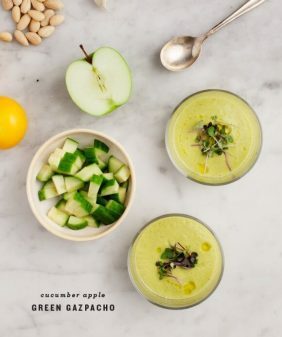 such a beautiful looking gazpacho…i absolutely love how it looks and will definitely be trying it this summer. This looks delicious. I’m such a soup person, but I’ve never actually had gazpacho. Definitely want to try it! I will have to try this! I never thought of putting mango in a gazpacho but I guess it would bring out the sweetness of the tomatoes. I’m surprised there was no green or red peppers. Wonderful pictures and recipes. Thank you! I made this using my Vitamix for a potluck dinner this weekend and it was the STAR of the party. It was like amazing velvety vegetable deliciousness. So fantastic. I added an additional step of reblending in the Vitamix after getting all the soup through the mesh sieve which made it just a touch more smooth and creamy. And don’t leave out the mango! It’s a fruity surprise flavor as a topping. Summer on a spoon! I off-roaded and threw in a preserved lemon and since my cilantro collapsed into a gooey heap overnight, I substituted fresh mint. As a lemon lover, thought you might find this riff interesting. Delicious and easy – the perfect recipe! I left it slightly chunky and garnished with mango & avocado. Will definitely be a staple.